All code presented here can be found in our Swag Shop repository on GitHub. 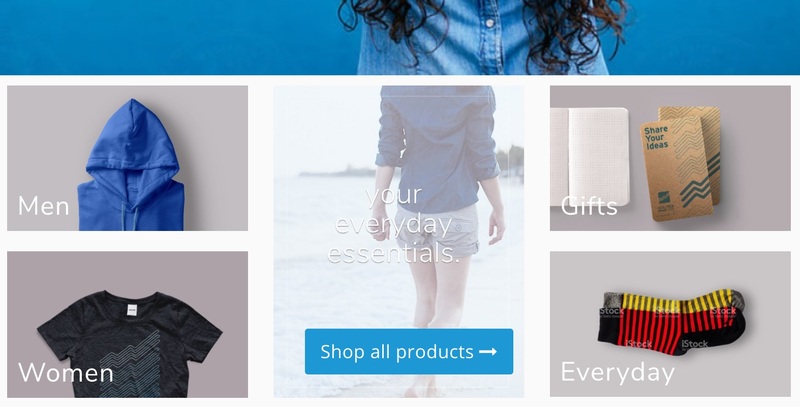 The purpose of category tiles is to provide users with another entry point for browsing tagged products. From a functional point of view, category tiles are identical to the default navbar tags that come with typical Reaction shops. Later, I'll show you how to make this field editable in the admin backend. For now, let's assume that in our Mongo database, all documents in the Tags collection have specified a string value for catTileImageUrl, eg. "cat-tile-women.jpg." Two things to mention here. First, as defined by Bootstrap CSS rules, the image consumes all available width on small devices, but only 1/3 of the available width for large screens. Additionally, the image is pushed to the right, since it should be centered when viewing on desktop. This snippet renders containers for each tile. It also ensures that the aforementioned Shop all products container swaps its place with the middle column container for large screens (col-sm-pull-4). As you can see, the actual image URL is read from the property catTileImageUrl, which we've added before to the Tag schema. It's important to mention that all public assets need to exist in the plugin's /import/plugins/custom/reaction-swag-shop/public folder, since the reaction-cli copies all files from there to its final destination in /public/plugins/reaction-swag-shop during the build process. Meteor's HTTP server will then make them available via the URL pathname /plugins/reaction-swag-shop/. The idea here is to connect the existing drag handle to a popover, where the catTileImageUrl property can be edited. Next, let's extend the original TagItem component from /imports/plugins/core/ui/client/components/tags/tagItem.js and override in the render() method. One interesting thing to take note of: this update is happening client-side through Minimongo. Minimongo takes care of propagating the changes via DDP to the server, where it will eventually synchronize with MongoDB. This method will only work with certain collections, as it requires special permissions to be set server-side. It's not always easy to secure big, complex applications, which may account for some of its controversy in the Meteor community. 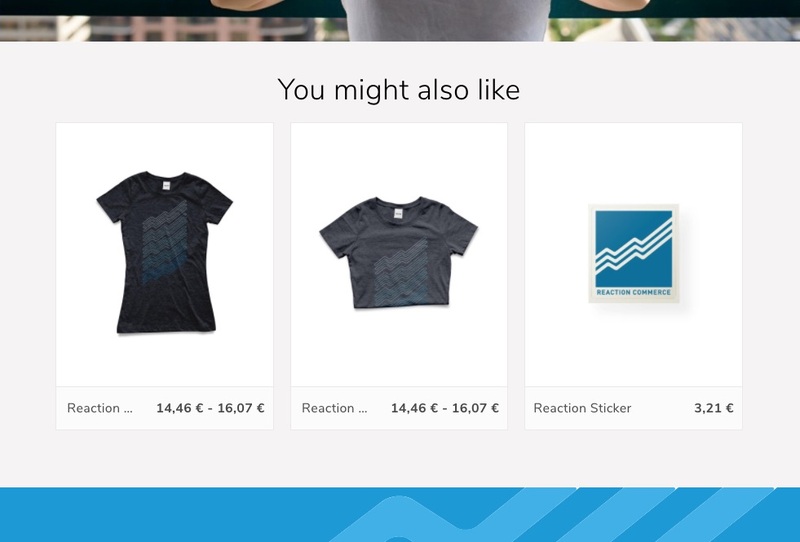 We need an existing product subscription that filters products for a specific tag. Each product gets its own tag in the Tags collection, the related product tag, which follows this naming pattern: <handle>-related — So for localhost:3000/product/t-shirt, the related product tag would be t-shirt-related. The admin UI already provides ways to add arbitrary tags to each product we're interested in linking. 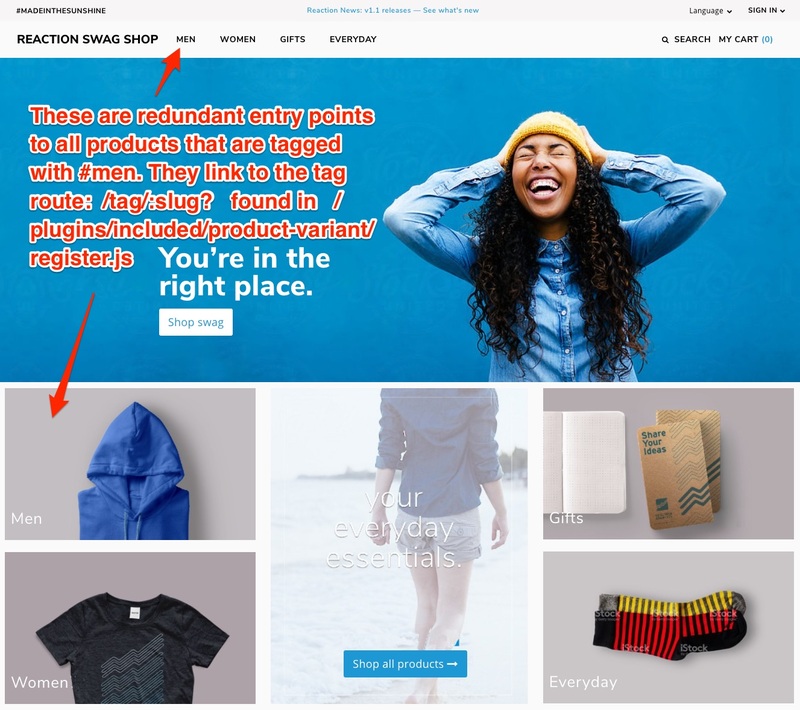 One product can be related to multiple other products through the tagging concept. It's possible to tag a product with <product-1-related> and <product-2-related>, which would appear as a related product on /product/product-1 and /product/product-2. Here, we're defining a new field, relatedTag on the product schema. We also want the field's value to automatically populate from the product's permalink. This is where SimpleSchema's autoValue comes into play. Whenever the field is updated (this.operator === "$set"), first check to see if it's a simple product, and not a product variant. Then, use the permalink to set the field's value. Create a new Tag in the Tags collection via Meteor.call("createTag", slug), if it doesn't exist yet. Because the initial products are inserted into the database through data fixtures, the field relatedTag can also be found in /imports/plugins/custom/reaction-swag-shop/private/data/Products.json. 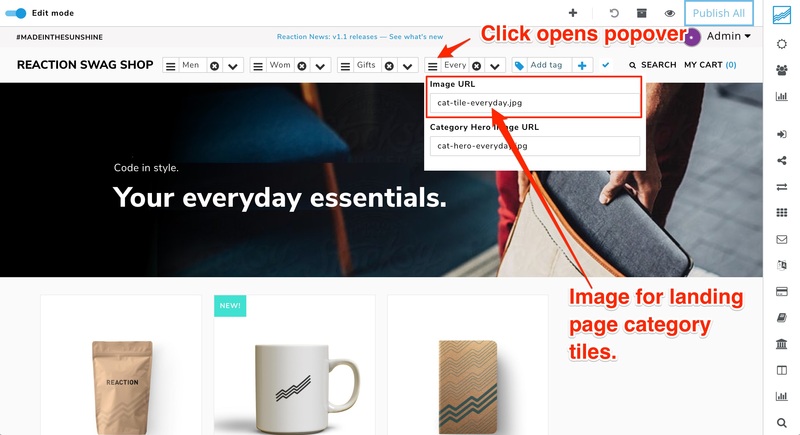 Overwriting the ProductDetail component to render the containers for the PDP filler image (called static image in the screenshot) and the related products section. A higher-order component (HOC) to inject the related products data from the database into the component that will render them. It uses the relatedTag schema property defined above to query for all related products. The PDP's layout is different from other components used in Reaction because it is configurable during runtime in a generic manner. This is possible because the React components are created dynamically from a data structure a in database, rather than from JSX that is living in static files and transpiled during build time. A ReactionLayout is made of different containers, or blocks, which themselves are made of other containers or concrete components. This allows users to have control over the rendered HTML structure in a very flexible way, while still having the ability to reuse existing React components. 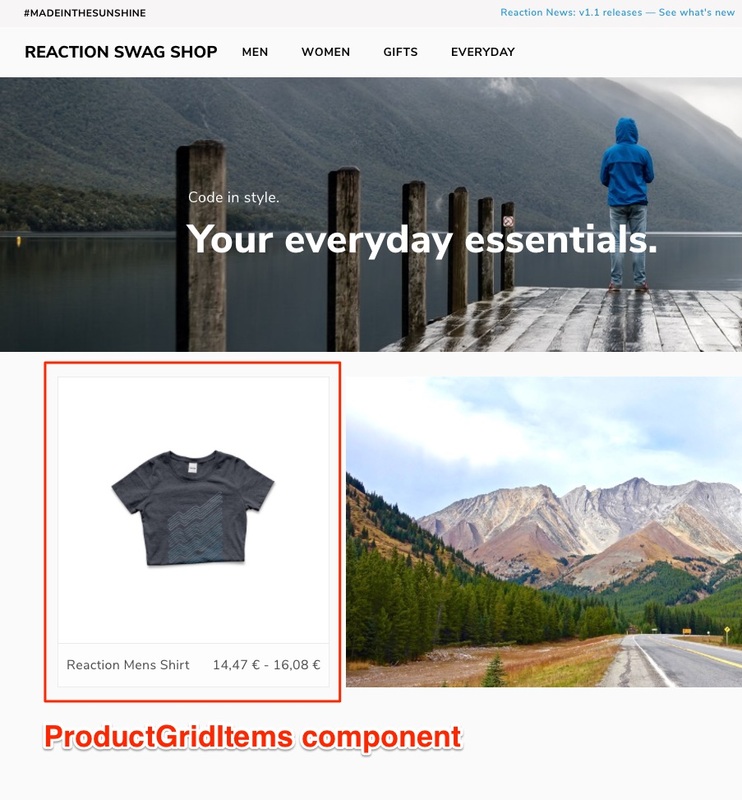 For the Swag Shop, the ProductTags component does not need to be rendered on the PDP, which is why we removed it, as seen in /imports/plugins/custom/reaction-swag-shop/private/data/productDetailSimple.json. Registration of the modified PDP layout can be found in /imports/plugins/custom/reaction-swag-shop/server/register.js. Now that we have a running shop, we want to show it to the world—and hopefully sell a lot of stuff. Generally, we recommend deploying via Docker Image. For an introduction into a self-hosted deployment approach, check out Deploying Reaction Using Docker. The Reaction architecture is laid out carefully, with a great focus on extensibility. For most use cases, we don't need to dig very deep into the code, although you could if you wanted to. It's totally possible to plug into the core mechanics of Reaction, such as cart, order processing, etc. and customize these workflows as they fit you. This is perhaps a bit more work than simply working with the components API, but once you're familiar with the codebase, it's not that difficult either. And that's how to create your own shop from scratch! We've covered all the basics on how to build a custom shop plugin. We hope you find the community team's swag shop series to be a valuable learning resource for your next Reaction project. If you have any questions or suggestions for the community team, feel free to join our next community call. Or, ask away in our developer chat.